The latest in a long line of classics (thanks again Kat) that are covering in this blog. Goldeneye 007 is the first of a rather select few of movie tie-in games that we will be featuring and is by far the most successful. It has been often crowned the best computer game ever released and if it is not at the top it is definitely very high up. At the time it received near perfect scores left, right and centre and since then has been the influence for every game since that involves either stealth or a gun-based multiplayer. Whether or not you like the game itself you are bound to have loved those which followed in it’s wake. Since I had previously owned this game it was mostly left to Jeroen to play through most of the missions. We had a good bash at the multiplayer though, if they code it we will game. James Bond it is. I think I’m rather like him. Handsome, smart, fast, and with a license to kill. Well, nearly like him then. I will not rise to the bait… I am strong and can avoid the obvious gag. 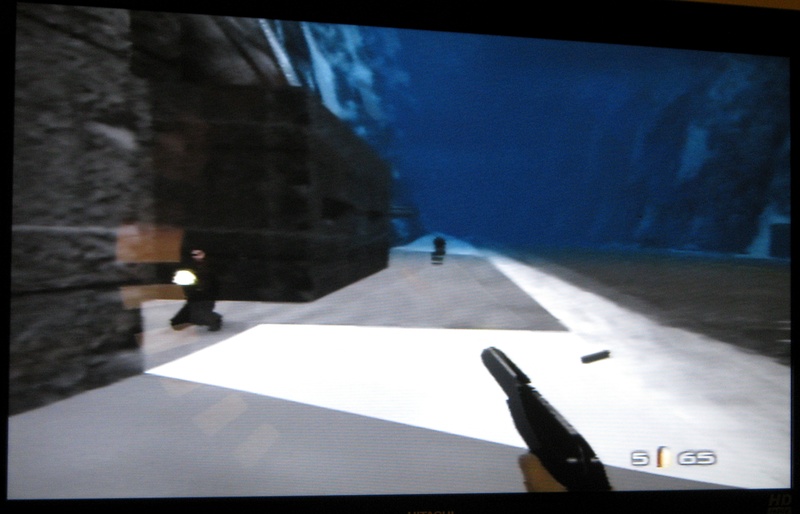 So let’s go beyond the simple choice of whether to flatter or shatter illusions and talk about Rare’s Goldeneye 007. One of many iconic games that we will see by this developer. And much-loved, one of the huge games of its day. It invented a lot of what we would commonly associated with shoot ’em ups. As well as most action games and some FPSs. And did a lot to move the genre to the console as well. It pioneered stealth and a truly revolutionary multi-player move. Yet, even when I used to own it over 10 years ago, I hated it. It is almost forbidden for a gamer to say that, but I never liked it. Even now when I play it I can appreciate what it did for games on the whole, it is truly one of the landmark games in the industry’s history, however, I was relieved when we actually stopped playing it. For me, it’s the controls that are the most frustrating. Partially this is probably because of the age of the game and where they started, but it is still annoying. They feel slightly counter-intuitive, but are also inaccurate – it’s hard to aim or even walk accurately somewhere. This isn’t helped by the lack of any sort of help – there’s no clue, for example, how to copy a key, you just have to keep looking for anything that helps, and then spend ten minutes trying to figure out how to use a ‘key analyser’, all of this while being set upon by infinitely respawning enemies. The upside to the infinitely respawning enemies is the ability to execute an infinite amount of crotch-shots. Something almost mesmerizing about watching them double over in pain. If you can manage it. Not helping is the thing that is a problem of all FPS games of its day – due to technical limitations, corridors look the same, and the reuse of textures and such can make it harder to find your way around – you get lost more easily, not knowing what’ll show up where. Due to the lack of hints on what to do or how to do it, it gets frustrating after some time. This is overtly negative to be fair as the multiplayer mode is actually good fun. Oh yes, the multiplayer game is great. So is the single player mode, as those frustrations are really the only ones I had, but multiplayer is where the game really shines. It suffers from the problem that it can be hard to know where the other player is due to the radar but it’s great fun (much better than when I used to play it by myself). The radar is challenging at times, but helps (and I wished I could have it in single player). And it’s fairly balanced, in part due to the complete lack of health regeneration. You want to avoid shots… and if you know you’re about to die, taking people with you, even if it doesn’t take off full health, is a worthwhile tactic – they’ll be easier to get next time. I did that to you with a rocket launcher in the face if I remember correctly. For some reason I always prefered to play multiplayer as Jaws. (As in the guy from Moonraker not the shark, although that would be awesome) It’s hard to say why it does work, but multiplayer shines, and that’s the one thing you must try when playing the game. One thing to note, which is quite interesting, is that the multiplayer mode was actually an afterthought. One programmer sat on his own for a few days to add it in, but it wasn’t originally part of the work done, which is why it’s even more amazing that it works so well, but possibly also shows how the simplicity makes it easier to pick up and have fun with it. I guess that does help to explain why some of the levels involved felt a little unfinished. Yeah, roughly build to provide a challenge, but not to be as visually attractive or expansive. Something that seems to afflict the game in general anyway – you get the feeling there should be more to see and do in some levels. Some of the levels do feel very small indeed with the actual objectives to be fairly limited. I mean the first level tasks you with bungee jumping off of a dam… I guess that’s more explained if you know the film. And apparently, if you read up on cut stuff, the original goal was to get a speedboat and get supplies from another island before you can do the bungee jump to escape. That would make more sense. One thing about this game I am thankful for is them not including that god awful theme song by Tina Turner. I liked that at the time. Seriously? I can only name a handful of Bond songs that I really liked and Goldeneye really is not one of them. I was ten, eleven? It was a huge hit back then. Once hailed as the perfect game of the time, and there’s no doubt that this game was great compared to what came before it. Good multiplayer, a nice single player story, something that ties together well. These days, the graphics are, of course, dated and the controls aren’t great, but this remains a good game. Although, as a PC gamer, I’m tempted to say that in part, this does follow trends set in the PC world earlier. Still, being able to apply this to the console, in its own way, is a revelation, and one often followed up on and improved.